The 2019 edition of the Longleaf Writers Conference will welcome as visiting writers National Book Award finalist Rebecca Makkai and poet/essayist/memoirist Brian Turner. Both will attend the full week of the festival. Turner earned an MFA from the University of Oregon before serving for seven years in the U.S. Army. According to the bio on his website, he was an infantry team leader for a year in Iraq with the 3rd Stryker Brigade Combat Team, 2nd Infantry Division. Prior to that, he deployed to Bosnia-Herzegovina with the 10th Mountain Division. He directs the MFA program at Sierra Nevada College and is a contributing editor at The Normal School, a literary magazine. His latest book is My Life as a Foreign Country: A Memoir. As visiting writers, Makkai and Turner will sit in during workshops and offer thoughts and suggestions about the work of attendees. In addition, each will conduct a seminar on writing, deliver a reading and engage in a question-and-answer session. Faculty members, including festival co-directors Seth Brady Tucker and Matt Bondurant, Diane Roberts and Ann Fisher-Wirth will perform like duties, running small conferences, offering feedback, presenting seminars and book readings and making themselves available for book signings. The conference also brings literary agents to town. The Longleaf Writers Conference was established in 2013 by Florida State University doctoral degree alums and authors: Tucker, who is an associate professor at the Colorado School of Mines and a one-time bartender at Borago in Grayton Beach; and Bondurant, an associate Professor at the University of Mississippi; along with Jonathan D’Avignon, the principal at the Walton In“10”sity School of Excellence in DeFuniak Springs. “In our first year, we had two award-winning faculty members teaching workshops to 11 attendees with no financial aid offered to scholars or fellows,” Tucker recalled. “In 2018, we had a total of five major writers working as faculty with four fellows and five scholars and 38 paid enrollees. The conference counts integration with the community as an important part of its mission. To that end, Longleaf makes á la carte offerings, including seminars, agent consultations and a series of free reading events available to the general public so that people who just happen to be at the beach for the weekend can drop in and enjoy the conference. “We see ourselves as an asset to the local community, as a outreach service organization and as a driver of local commerce and general attention,” Tucker said. “We think many beachgoers would love the opportunity to drop in on a morning seminar for a nominal fee, meet with a New York City agent to discuss their memoir in progress, or attend a reading or lecture given by a Pulitzer Prize winning author. Longleaf’s Writers in the Classroom initiative sends conference fellows and scholars into local schools to spend a day with students doing writing exercises and talking about writing and reading in general. In the past five years, Writers in the Classroom has worked with more than 500 Walton County students in seven high schools and middle schools. 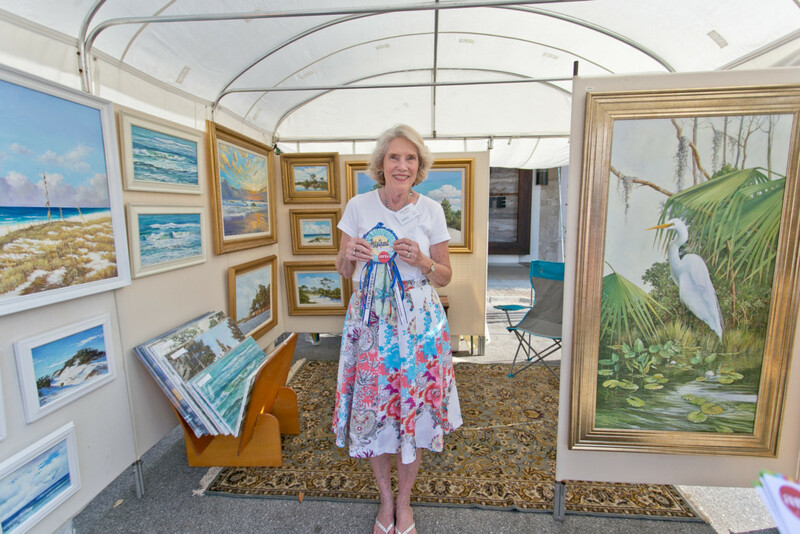 Now In its 31st year, ArtsQuest: A Fine Art & Fine Craft Festival takes place at the Town Center of Grand Boulevard at Sandestin each Mother’s Day weekend. The festival provides an opportunity to view and purchase original art from more than 150 artists from around the country while also experiencing live musical entertainment, ImagiNation (where kids rule), student exhibits and great food and beverage options. ArtsQuest is a juried show that includes artists in the categories of ceramics, fiber, glass, jewelry, metal, mixed media, oils and acrylics, original digital art, photography, sculpture, wood and works on paper (watercolor, printmaking, pastels, pencils, ink). The festival awards $10,000 in cash prizes and is a rain-or-shine event. Theater Festival May 16–20, Grand Boulevard The mission of the Northwest Florida Theatre Festival, conducted at the Emerald Coast Theatre Company, is to unify theater and performing arts in Northwest Florida and to showcase the talent, work and productions of numerous organizations and people. The festival is an inclusive and creative celebration of a community of artists, one that embraces both the differences and common denominators among us. The festival encourages all to take the stage as a performer or to become part of the audience for an innovative and avant-garde collection of arts and artists. Digital Graffiti is a one-of-a-kind projection art festival in which artists employ the latest digital technologies to project original works onto the white walls of Alys Beach. Engaged in a genre sometimes referred to as photon bombing, guerilla projection or urban projection, underground artists around the globe have been using design, animation and projection technologies for many years to cast dynamic images onto skyscrapers and other urban structures as a means of artistic expression. Digital Graffiti brings these artists together in one place to celebrate and showcase their unique talents. Each year, the festival attracts digital artists, filmmakers, musicians, interactive designers, photographers, VJs, producers, celebrities, agency executives and fans of art, technology and architecture. Digital submissions are received from far-flung locations including Israel, Austria, Canada, Germany, London, India, France, Italy and China. The exhibition is designed to enhance the quality and excellence of Rosemary Beach by complementing its architectural richness and natural beauty with outdoor sculpture. It is a biennial juried show that takes place in a community that is home to one of the 30 most beautiful main streets in America, according to Architectural Digest. Public art has long been a staple in traditional towns, whether to honor a local hero or to bring attention to the community’s cultural heritage. In today’s postmodern era, a contemporary outdoor sculpture in a neo-traditional town can uplift and inspire people in a similar fashion. Several events are planned around the exhibition, including an artist panel discussion, opening reception and student participation. Guests will circulate among the vessels, supplied by Galati Yacht Sales, sampling offerings from Signature Catering 30A and imbibing, at their pleasure, spirits from Timbercreek Distillery, Idyll Hounds beer, and wines courtesy of O’Brien Estates and Farmer’s Daughter Wine. Artists and writers representing a variety of disciplines and genres ranging from projection art to storytelling will engage guests with their works and their words. Together, they will ensure that each yacht presents a distinctly different experience. They will include Chandler Williams of Modus Photography in Santa Rosa Beach. The event, planned and sponsored by Rowland Publishing and Emerald Coast Magazine, will begin at 7:00 and also will serve as a coming-out party for the magazine’s annual arts edition. Live music will add to the festivities. Door prizes will include a trip into the Gulf aboard a Galati yacht. Attendance will be capped at 100 guests, making for an intimate affair. A limited number of tickets are available for purchase at 850tix.com. Event proceeds will be donated to the Cultural Arts Alliance of Walton County.